Having all my Moton shocks rebuilt right now. The previous owner had set the car really low in part to get the camber they wanted. I've added adjustable LCA's to the front and toe links to the rear (car is slotted front and rear and has camber plates in front). They had used 4" springs front and rear with some strange spring perches in the rear. I'm going back to the stock Moton pieces along with the rebuilt Mode mounts. Increasing spring length to 5" in front and 6" in rear along with helper springs. With the Moton ride height is adjusted at the upright so I have a fair amount of adjustability. I know there are restrictions of ride height for you spec boxster guys - but just curious what everyone is running ride height wise. I measure from lip of fender to center of the wheel. i run m030 ride height. look at your lower control arms - your car should not be so low that they are horizontal. if they are horizontal, then when you are turning and the outside suspension is compressing, the lca's will travel past horizontal and actually start reducing camber by pulling the bottom of the wheel carrier inwards. race cars actually relocate the inboard attachment points upwards so that they can run lower and maintain suspension geometry. to fully tune it, determine max suspension compression, then set your ride height such that lca's are horizontal at max compression (ie, if with the springs on your motons you anticipate max 1" of compression, static ride height should be set such that the outboard end of your lca is 1" below horizontal). For SPB, rules say: "Ride height minimum 90 mm front and rear as measured at front cross of aluminum cross member and front-to-rear braces near rear sway bar." With that in mind, the smart guys keep saying you definitely do not want to actually go that low. Where the sweet spot is, I'm not sure. Where the sweet spot is, I'm not sure. The sweet spot is where aerodynamic drag and suspension performance are optimized. Set the ride height too high and the car has too much aero drag. Too low and the suspension geometry isn't optimized or might even be on the bump stops and the car doesn't handle/grip as well as it could. Finding that sweet spot in the middle is an art. 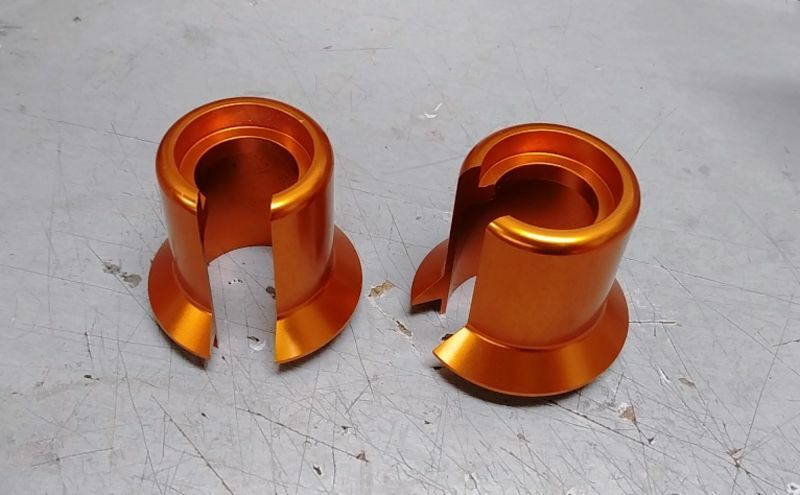 For SPB, rules say: "Ride height minimum 90 mm front and rear as measured at front cross of aluminum cross member and front-to-rear braces near rear sway bar." With that in mind, the smart guys keep saying you definitely do not want to actually go that low. For SPB's, setting the ride height at the specified minimum has been found to compromise suspension performance - this is why guys much smarter than me say not to go this low. ... but just curious what everyone is running ride height wise. I measure from lip of fender to center of the wheel. Joe, to get you into the ballpark, my car is set at 12.125" front and 12.50" rear from center of wheel to fender lip. 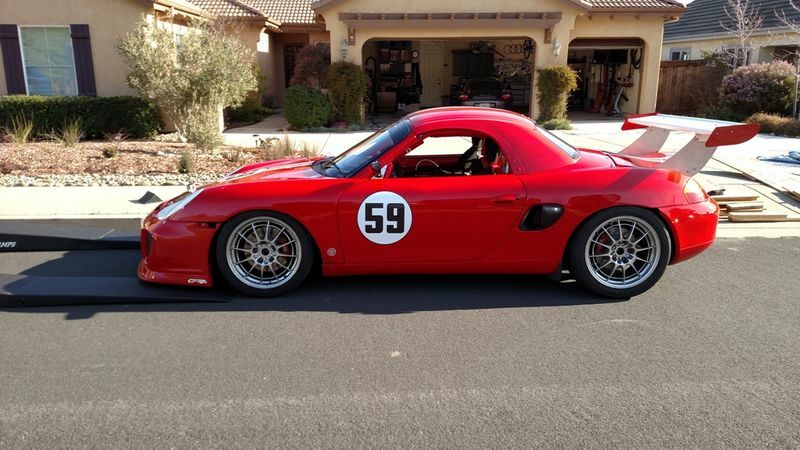 I have seen other Spec Boxster's set higher and others set lower. Your mileage may vary. Last edited by thstone; 07-07-2018 at 02:03 PM. Thanks for the insights folks. I forgot to measure my front before disassembly but I have measurements from the coilovers locking plates so I'll get real close on install. The rears were at about 32 mm and the fronts were about 10mm lower IIRC. As you can see in this pic - it's pretty low. I'm running 700lb front and 800lb rear. New Eibach's, 5" springs in the front with a helper and 6" springs in the rear with a helper. Car previously had 4" springs with the same helper all around in the same weights. The car as shown in that picture was previously set at 30 cm front and 32 cm rear. Car is back together and it sits at 31cm front and 33cm rear now. Can't go any lower in the rear due to the shock design. When I had the shocks rebuilt - they were concerned about the non-standard spring retainer that had been welded to the MODE shock mount. 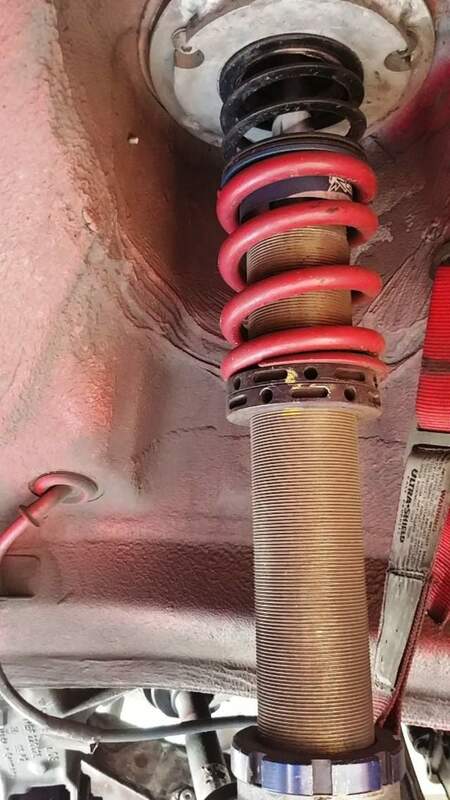 It was resulting in a slight misalignment of the shock. Here's of picture of the shock with the modified mount and the 4" springs as well as a limiting strap. When the strap was unbolted, the shock would drop down about 1.25 inches and the spring would come apart from the retainer. The modified mount saved another 3/4" of shock height as well - since he spring sat farther up. So the strap allowed the springs to remain seated when unloaded. You will also note that the spring combiner perch sits right at the top of the shock body. Due to the misalignment - it had been rubbing on the shock body and cap. Luckily the damage was minimal. We removed the welded on piece to the mode mount - and used the standard Moton top spring retainer. Here's a pic of the retainer. 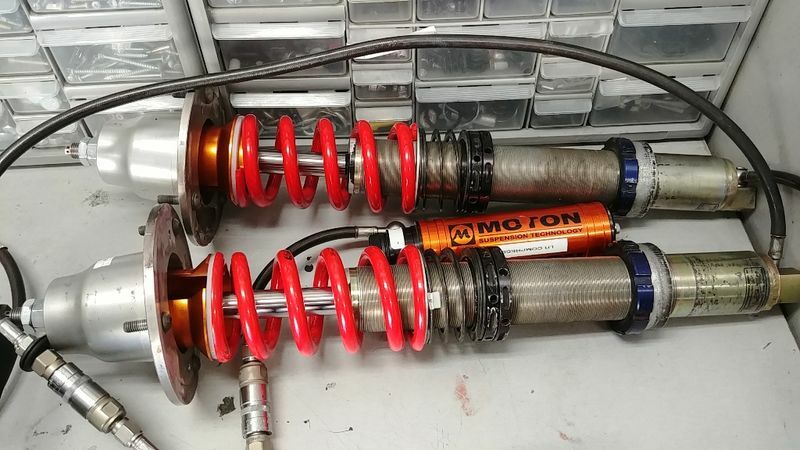 Rear shocks with the Moton spring retainers. I could have retained the limiting straps - and moved the spring perch down a bit to get the car as low as it originally was - but I didn't want to use them and I'm fine with the ride height being 1 cm higher. As you can see - these Motons were designed to use the factory "bell" top mount. The new Motons use a much shorter shock now with their own flat top mount. Sure wish I had those - would have made life much easier.